The flag of Nepal is arguably the most unique national flag in the world, being that it is the only non-rectangular national flag. With a flag so unique, you would think that there would be a clear story behind it’s creation. 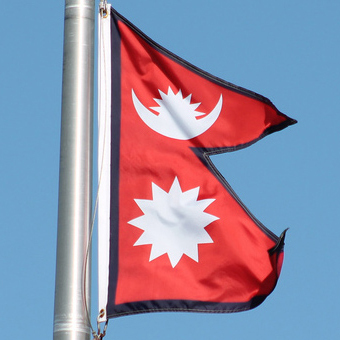 Well, the history behind the Nepalese flag design is about as clear as mud. What we do know is that the design is a simplification of two pennants flown on the same hoist. We also know that pennants were the flag type of choice in Central Asia for centuries (and can still be found in areas practicing the Hindu faith). Historical accounts vary from there. One says that the design was adopted after Prithvi Narayan Shah united many principalities into what is now Nepal in 1743. Another says both of the pennants represent two factions of Nepal’s Rana dynasty, which ruled the country from 1846 to 1951. Either way, we know the double pennant design, or something very close to it, has been in use at least since the 19th century. Flag of Nepal prior to 1962. The flag’s history becomes clearer on December 16, 1962, when a new Nepalese constitution made the design the country’s official flag, with some slight variations. Prior to this date, both the sun and star in the pennants had faces (see right). The new 1962 design removed these faces in order to modernize the design. The shape: Stacking multiple pennant flags on one hoist has been a tradition in Central Asia, as documented by temple sculptures dating back to the 1700s and earlier. 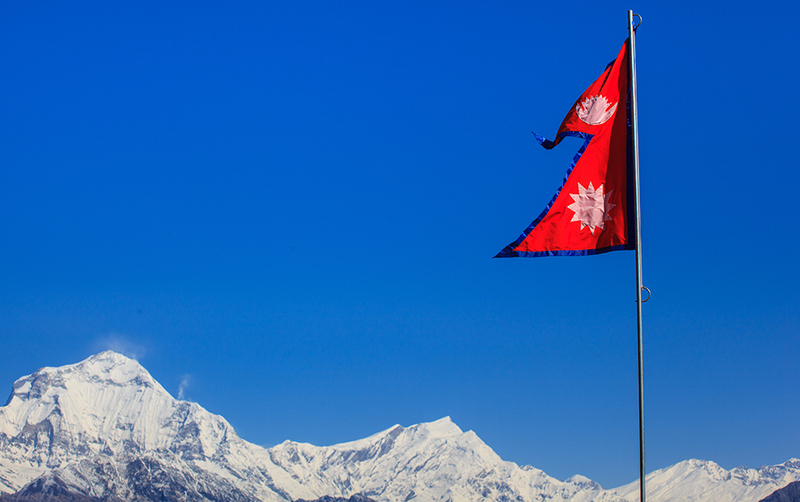 While many accounts refer to the Nepalese flag as a modern interpretation of this practice, others say that the unique shape represents the Himalayan mountains, which make up the vast majority of Nepal’s land area. Znamierowski’s The World Encycolopedia of Flags also says that the two points represent Hinduism and Buddhism (the two largest religions in the country) in addition to representing the Himalayas. The moon, star, and sun: As I mentioned earlier, one popular theory behind the origin of the flag is that it is a combination of the pennants of two rival factions within the Nepal Rana dynasty. 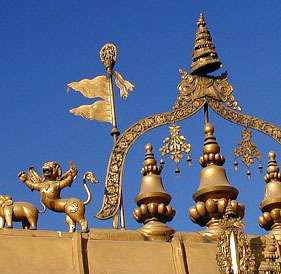 It is believed that the moon pennant represented the royal family while the sun represented the family of the Prime Minister (both members of the Rana dynasty). Another popular theory states that the celestial bodies are meant to represent that “Nepal will last as long as the moon and sun are in the sky.” While these are the two most prevalent interpretations, many more exist. Some examples include that they represent the peaceful and hard working nature of the Nepali people and that they are connected to some Hindu beliefs and rituals that are based the cycles of the sun and moon.